Will is a vampire in danger. Heir to the Earl of Mercia, he was brutally attacked and buried in the thirteenth century before he was able to assume his title. Will has developed a routine. He leaves his tomb every so often, feeds his bloodlust, and never gets close to anyone. Until now. Waking from a twenty-year slumber, he meets Eloise--but can't bear to make her his next victim. Drawn to a girl he can never have, but whose fate seems bound with his own, he feels the need to protect her. But Will has an enemy who will stop at nothing to find him . . . and he's closing in. . . .
K J Wignall is the author of five novels for adults and a number of acclaimed short stories. He's been nominated for an EdgarAward for "Who is Conrad Hirst? "andwas shortlistedfor the CWA Short Story Dagger in the UK. All of his work has attracted film interest and"For the Dogs "is currently in developmentin Hollywood. 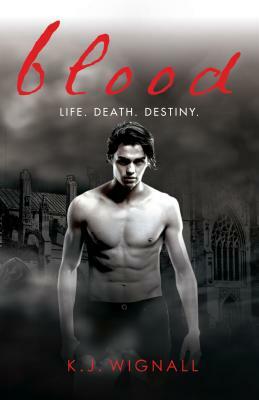 "Blood "is his first novel for young adults."